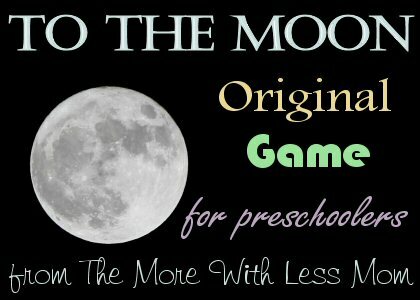 To The Moon, an Original Road Trip Game for Preschoolers from The More With Less Mom! Each player thinks of a noun: a person, place, or thing. The younger players take turns asking questions with a yes or no answer, like, “Is it an animal?” They try to narrow down the possibilities until they guess the item. Each side of the car is a team. Each team counts the cows on their side in a set amount of time, like before the next stop. Little ones can keep track of the count on their white board. You can count a different item if there are no cows, like red cars, dogs, or campers. Someone says a word. Another player has to respond immediately with the first word that comes to mind. The quicker the game the sillier the responses can get. So if the first player says apples the second player might say caramel. Then the next person might say cookies. And the next monster. Use the car radio and get everybody dancing. Then quickly turn off the music and everybody has to freeze. Then the music comes back on and you can start dancing again. The first player says “I’m going on a picnic and I’m bringing…” followed by something that begins with an A, like apples. The next player says “I’m going on a picnic and I’m bringing apples and…” something that starts with B, like bananas. This continues through the alphabet. 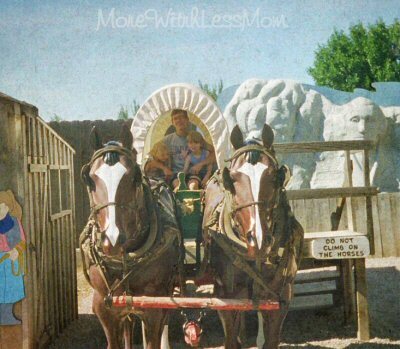 I would let little kids pipe up with the ones they remember, and big kids add new items. Pose questions to your kids like “I wonder where that car is going?” “I wonder where that road leads.” “I wonder what that dog is doing.” Have the kids invent a fun story. You have to see who is the quietest, not making any noises at all. If you want this game to last you need to properly motivate the children with a great reward. Like Oreos. This is a good game for a rest stop. Players line up behind an older player who is Simon. Simon gets to give the players a command, such as hop on one leg, touch your toes, or spin around. Simon must say “Simon says” before the command or the players can’t do it. Unless your kids are too little and this just frustrates them, then just have Simon say stop, more like Freeze Dance. Each family member takes turns creating one line for a story. “Once upon a time there was a family that liked rocks.” “Then they went rock climbing.” “Then the little one fell on her tush.” For older kids you can rhyme and even add a speed element. Try a paper game like Roll A Castle from Planet Smarty Pants. 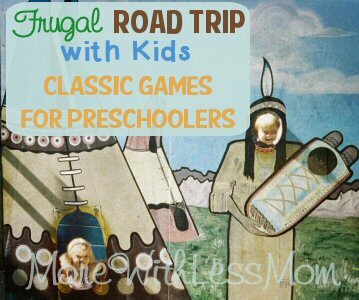 How do you provide cheap fun for your littlest little?